We are about to inform you about a modern miracle. 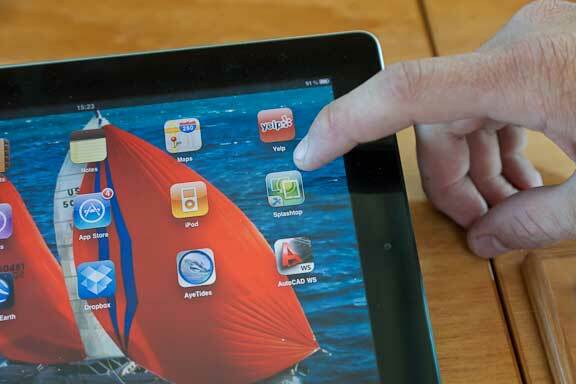 There is an IPad app called Splashtop, which claimed to allow remote control of a computer from the IPad. We were dubious but figured it was worth a try. The installation was simple, and under the guidance of Chris Martin we soon had Splashtop installed on the IPad and Mac Mini which serves as our nav computer these days. To start Splashtop tap the icon. Which brings up another icon that is tapped. And voila, a screen says that the IPad is in control of the other computer. Rather than use, a mouse finger commands rule. To zoom in use two fingers and drag down. Zooming out is dragging up. Panning uses tap and drag. To select an item tap and hold your finger down and the menu pops up. We now have a duplicate display of the desk top computer, with all of its data, at the flying bridge. The install was fairly simple. WIth the Apple operating system both IPad and desk computer have to be on the same wifi network (turn on Internet sharing on the control panel). Connecting to a PC requires a different common connection – we think this is called an ad hoc network – and might require some tech knowhow. Maine is an excellent place in which to test this and we’ll advise how it turns out. This entry was posted on Saturday, July 30th, 2011 at 12:01 am and is filed under Dashew Logs. Both comments and pings are currently closed. Ah! the ipad. 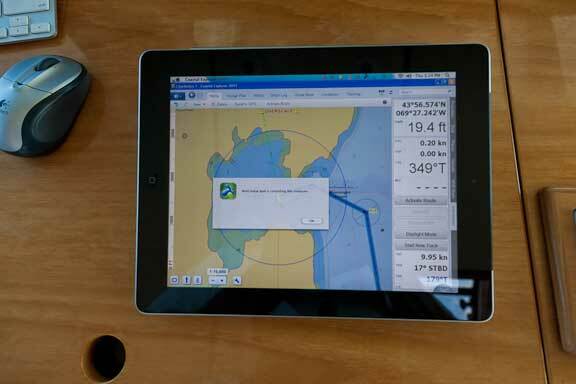 On my more modest boat it runs the GPS nav software itself AND allows me to do my work from the boat. The ipad has released me from having to be at home to work on my desktop computer there. This year I’ve spent 3 months cruising half round the UK, started in the Solent, currently in Scotland W coast. I’ve found good 3G connections in 80% of ports/anchorages. 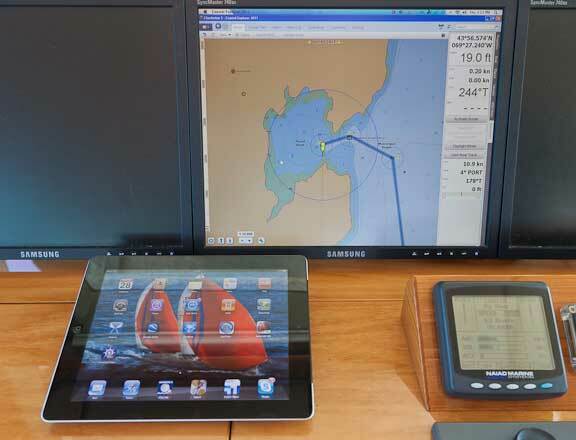 The ipad runs LogMeIn which lets me use the desktop at home – from the boat. I went cruising thinking I’d probably have to fly home to meet at least some of my 2 weekly deadlines. Never needed to fly home – the ipad is a wonder. Well you went through one of my favorite place in the world…Cape Cod. We have a house on the ocean side of the cape about 8 miles from Provincetown. Late June, the whales you saw were playing right off our beach and we could watch them from our porch. Not as close as you were, but telescope makes it seam that way. 2 years ago we took sone friends out on a commercial whale watching boat and one Whale eased against the hull and almost appeared to be scratching her own back. The come to this area because of Stellwaggon Bank, an incredible feeding area not only for them but for many species of aquatic life. It’s amazing when the blue fin tuna are feeding there…streaking through the water at incredible speeds very near the surface of the water…. Steve, could you please elaborate on this? 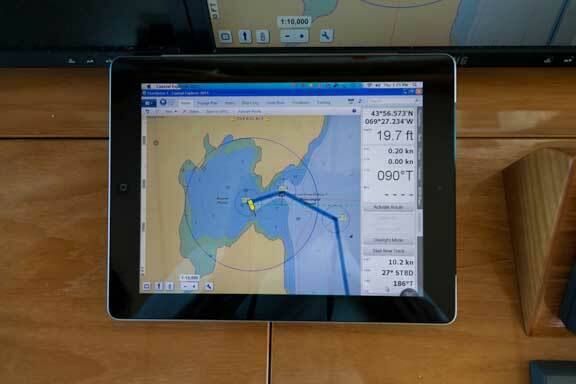 Is your Mac Mini a standalone GPS/Nav computer, or is it integrated with your autopilot/radar/ship navionics? I’m thinking of upgrading my 1980’s vintage radar and electronics and looking for any information to help me in the design. 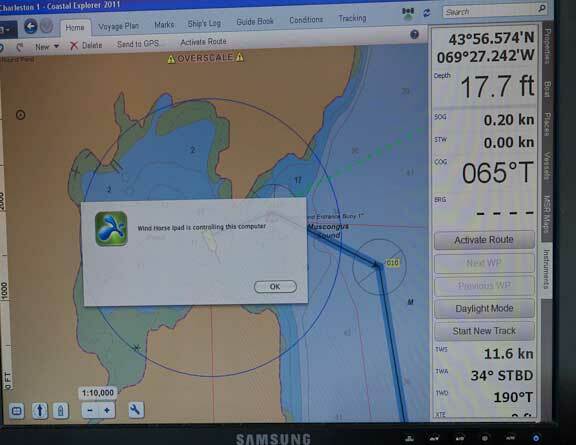 We are using a Mac Mini running Parallels and then the nav software – Coastal Explorer right now – in Parallels. Seems like a good solution. Will it work without an internet connection? And if not can it be set up as a local network? My flybridge monitor just had a fatal heart attack. Splashtop does not require an internet connection. But both Ipad and the controlled computer must be on the same wireless network.